San Diego may be best known for its hop-forward IPAs, but this county has a long and proud history of stouts, porters and the dark arts. 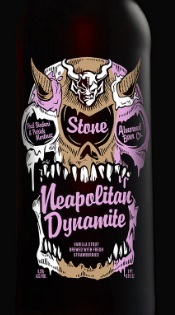 Case in point, the winners of this year’s American Homebrewers Association-sanctioned Stone Homebrew Competition: Paul Bischeri & Patrick Martinez and their champion creation, Neapolitan Dynamite. For our additional collaborator, we enlisted noted Stout Master Derek Gallanosa from Abnormal Beer Company to bring this ice cream sundae of a beer to life in full scale. The result is a rich, decadent beer, with the sweetness of the strawberry and vanilla balanced out by dark chocolate and coffee. Available in bottle and on draft, but not on a waffle cone, unfortunately. 2015 Chateauneuf du Papes score big again! Beer Tasting Tonight - Forsyth!